Anna and Wendy discuss episode 50 of Chronologically LOST, Episode 050 – November 12-15 2004 (day 52-55), featuring the A-Team returning without Michael, Charlie’s obsession with getting Aaron baptized, and the beginnings of romance between Hurley and Libby. Podcast length 1 hr 15 min. 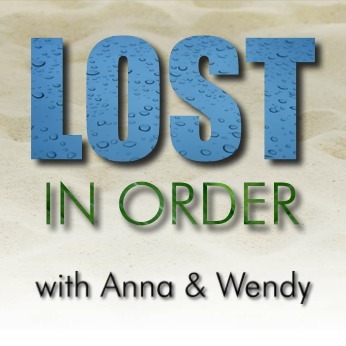 Anna and Wendy discuss episode 49 of Chronologically LOST, Episode 049 – November 9-12 2004 (day 49-52), featuring Michael going out to find Walt, Claire finding out about the heroin in the Mary statue, Charlie taking Eko to the beechcraft, and a team setting out after Michael. Podcast length 1 hr 22 min. Anna and Wendy discuss episode 48 of Chronologically LOST, Episode 048 – November 8-9 2004 (day 48-49), featuring the Tailies’ slow and uneasy entrance to the Losties’ camp, reunions, Eko and Locke meeting, Kate taking care of septic Sawyer, Kate’s horse, and Shannon’s funeral. Podcast length 1 hr 9 min. Anna and Wendy discuss episode 47 of Chronologically LOST, Episode 047 – November 7-8 2004 (day 47-48), featuring Eko and Jin tracking down Michael, Sun finding her wedding ring, the shelter Sayid built for Shannon, the Tailies nearing the beach camp, and Shannon and Sayid chasing Walt through the jungle…right into the path of Ana Lucia. Podcast length 1 hr 35 min. Anna and Wendy discuss episode 46 of Chronologically LOST, Episode 046 – November 6-7 2004 (day 46-47), featuring Hurley’s handouts, exploring the hatch, the Arrow station, Sun losing her wedding ring, and Michael running away from the Tailies to look for Walt. Podcast length 1 hr 8 min. Never Let It Fade Away: Roller Coaster Smoke – song (original) and video (clips from Lost) by Punchline. Can also be found on Spotify, Vimeo, Amazon mp3, etc!